We have collected and analyzed 4 expert reviews and 359 user reviews from international sources. Experts rate this product 73/100 and users rate it 87/100. The average review date is Nov 14, 2015. We have compared these reviews to 1531707 reviews from other TVs. The alaScore™ for this product is 90/100 = Excellent. Last update: Apr 19, 2019.
alaTest has collected and analyzed 47 user reviews of Samsung UE48JU6400 Series from Amazon.co.uk. The average user rating for this product is 4.0/5, compared to an average user rating of 4.3/5 for other products in the same category on Amazon.co.uk. The 48-inch Samsung UE48JU6400 is an excellent choice of TV for family viewing. 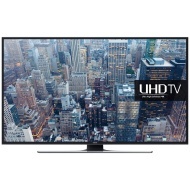 With UHD (4K), excellent picture quality and Samsung's latest Smart TV system, it's a top-notch performer. We like its attractive styling, and pricing is very competitive too. A preview of the new 48-inch entry-level flat screen Ultra HD 4K LED LCD TV from Samsung for 2015. Sound isn't as good as the old TV but it seems it's not these days! The Sound could be better,but would have to spend a lot more to get that perfect sound.